So I recently (as in a few weeks ago) discovered Goodreads’ new year-in-review feature where it shows you your year in books. I don’t know if Goodreads had this set up for the last few years and I’m just now discovering it or if this is totally new, but I am digging it. According to Goodreads, I’ve read a total of 32,165 pages! That’s a lot of pages! I’m sure there are people out there who have read more than that this year (Heck, I used to be one of those people who could read 150+ books per year), but I felt like a book-reading failure this year, so that page number and those 102 books make me feel very proud. Ha! So my shortest book isn’t really a book—it’s a novella. Big surprise. What is surprising is that this wasn’t one of the novellas I was reading to further my Goodreads goal. I think I just read this book randomly. As for the longest book, up until a few days ago, my longest read was actually Queen of Shadows by Sarah J. Maas, but I snuck Winter in at the last moment. And boy is that thing hefty! Oh, and apparently those novellas I crammed in there didn’t mess with the average length of the books I’ve read this year, because 322 pages per book (on average) is fairly normal. I guess I read some longer books this year to balance everything out. 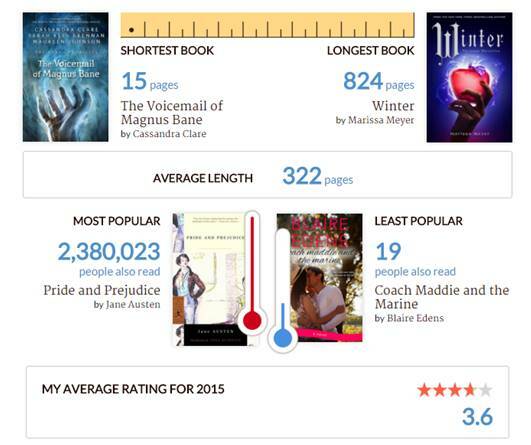 I’m super surprised that Pride and Prejudice has been read by over two million people! I mean, I know it’s popular. It’s a classic. But two million! In comparison to my least popular read, that’s an insane difference. My Average Rating on Goodreads is actually a lot higher than I thought it would be. I feel like I’m constantly giving books negative reviews, but I guess I’m really not. Weird. 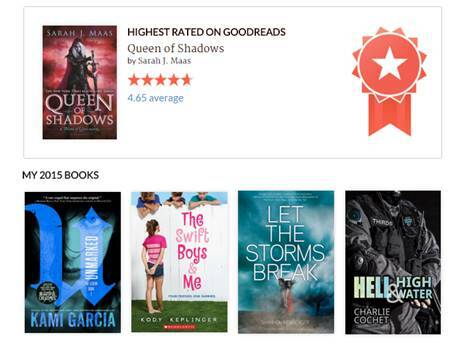 And the highest rated book I’ve read, Queen of Shadows, is definitely not the highest rated by me. I think I gave Queen of Shadows four stars? Maybe 3.5? I’m not sure. All in all, it’s been a pretty good reading year. I’m excited to see what awesome adventures 2016 brings! Oh, and let me know how your 2015 reading year went in the comments.